Far Cry New Dawn review: What comes after the nuclear storm? By no means a must-buy but eventually proves to be a clever, if subtle, rework of Far Cry 5. Ubisoft has an established tradition of unexpectedly releasing interim takes on its Far Cry franchise, which fill gaps between full, numbered iterations. 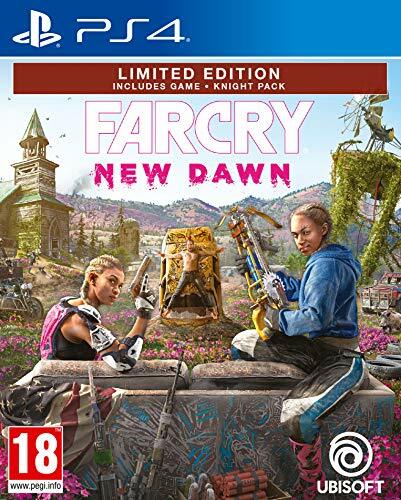 Thus, Far Cry New Dawn - which arrives a mere 11 months after Far Cry 5 - can be bracketed along with the likes of Far Cry: Blood Dragon and Far Cry: Primal. But unlike those two games, which veered off into left-field territory (80s pastiche and prehistory) New Dawn is very much a sequel to Far Cry 5 - Far Cry 5.5, if you like. Which is a tad disappointing, especially in this era of story-extending DLC, and that sense of disappointment doesn't instantly abate when you first launch Far Cry New Dawn. The game's premise is an intriguing one: 17 years after the events of Far Cry 5, in which Hope County was engulfed in a nuclear apocalypse, the survivors have re-established a foothold above ground and are struggling to build new lives. So you find yourself back in familiar territory, albeit radically changed: 17 years have left Hope County overgrown with pink and purple flowers and most of the houses are derelict. A new bunch of enemies have moved in to terrorise the neighbourhood (and spray-paint it pink and yellow; New Dawn's colour-palette is extraordinary): the Highwaymen, led by the psychotic twin sisters Lou and Mickey. They are a millennial band, working out their rage at what the older generation has done to the environment, forming an apposite underlying theme to the game. So details have changed, but at first it all feels overfamiliar - like an elaborate item of Far Cry 5 downloadable content. However - mercifully - that first impression eventually proves inaccurate. Far Cry New Dawn is undoubtedly a slow-burner and the more you play it, the more you appreciate the clever ways in which Ubisoft has tweaked its gameplay in order to provide a subtly different experience to that of Far Cry 5. Story-wise, it feels somewhat disjointed, since Ubisoft has concentrated on varying gameplay across the story missions. One sequence featuring an older, chastened Joseph Seed cranks up the Bliss-induced visual weirdness and marries shooting fire-arrows with puzzling and a boss-battle; at other times you might find yourself bare-knuckle brawling, performing a hit in a prison or testing your driving-and-shooting skills in a demolition derby. In New Dawn, you play the otherwise unnamed Captain, head of security for a guy called Thomas Rush, who has been establishing new communities elsewhere in the US. Carmina Rye - seen as her mum Kim's pregnancy bump in Far Cry 5 - summons Rush and co to Hope County, but the train in which they ride is derailed by the Highwaymen, so your first task is to spring Rush from incarceration. After which one of New Dawn's main innovations reveals itself: your home base, Prosperity. Rush and the locals populate this with Specialists in fields like weaponry, medicine, horticulture cartography and explosives. Upgrade each element and you get access to new weapons, more health, useful maps and the like. To upgrade your homestead you need ethanol, which is one of New Dawn's few nods to its post-apocalyptic setting (there are no zombies, nobody worries about radiation and life goes on much as before, albeit in a more rustic manner). And the best way to collect that is to take over outposts from the Highwaymen (although you can also hijack their trucks, which is every bit as fiddly as hijacking trucks without blowing them up was in Far Cry 5). At one point, in order to advance the storyline, you must find some missing Specialists and upgrade Prosperity to a prescribed level - a classic example of grinding. But in this instance, that grinding proves enjoyable (always the sign of a nicely fettled game), and Ubisoft has assisted you with a mechanism that lets you scavenge extra ethanol from each outpost, abandon it again to the Highwaymen then retake it from them - albeit from higher-level ones who are more aggressive and harder to kill. The higher-level Highwaymen start to enter bullet-sponge territory, but that doesn't prove to be too much of a problem thanks to a number of factors. Firstly, you can take them down much quicker with headshots but secondly, the weapons system differs drastically from that of Far Cry 5. New Dawn's weapons look makeshift, as befits a post-apocalyptic game, but improve drastically every time you upgrade your weapons bench in Prosperity. And there are some imaginative new ones, such as a circular saw-launcher with large amounts of aiming-snap, which causes huge damage and ricochets between enemies. New Dawn also coughs up points for Perks with much more alacrity than Far Cry 5 - particularly if you go looking for treasure stashes - and after your encounter with Joseph Seed, in which he finally gets to enact his version of the Garden of Eden story, you get super-perks which basically turn you into the Incredible Hulk for a short period. That also helps when you encounter enemies which are more problematic than those in the original game. There are some great new Guns for Hire, too, including a wild boar, a geriatric sniper and some familiar characters from Far Cry 5. Ubisoft has added new elements to the familiar gameplay mix, too. You can embark on Expeditions with a French helicopter pilot, who takes you to far-flung, heavily guarded locations in which you must locate a stash, pick it up and escape to an extraction point while under heavy pursuit. There are also supply-drops (a nod to battle royale games) marked with smoke, which you must race the locals to - they are worthwhile since they include some ethanol as a reward. In terms of general feel, New Dawn's gameplay is precisely what you would expect from Far Cry, but the longer you play the game, the more you notice how Ubisoft's tweaks to the weapon and perks systems, along with enemy strength, have bred a subtly different feel to proceedings. Whether that's enough to make you consider it a worthwhile purchase is a matter of personal taste, though. If you thoroughly enjoyed Far Cry 5, then you'll definitely enjoy New Dawn, as long as you get past the early stages in which it's too similar to its immediate predecessor. Ubisoft has cleverly freshened New Dawn's gameplay, but overall it still pretty much plays the same as Far Cry 5 - so it couldn't be said to be the most essential of purchases. But it has been developed with intelligence, and offers a fine example of how to reuse assets in a very imaginative manner. It's an oddity which some will find over-familiar, but it's undeniably fun to play. This article was initially published on 23 January 2019 and has been updated following completion of the game.